Hi everyone, or hej as I would say if I were still in Sweden! It's me, Lena Skvagerson, bringing you our latest update. I'm jumping in to talk about all the fun going on in episode five of season nine, and also to give you a sneak peek of exciting new things to look forward to. Some of you have already been able to watch season nine for a couple months, and others may not find it for a few more weeks; such is the way of public television. Each public television station is independent, so they air the show on their own schedule. That is why we have the station finder. Just put in your ZIP code and you will find your local station; then you can go to your station's website to see when Knit and Crochet Now! is on. In case you haven't been able to see the latest season, click here to see a short preview of any episode. And, yes! Season 10 is already fully in the making. You have plenty more knitting and crocheting tips and tricks to look forward to! Connie and I have been busy bees coming up with 39 new and exciting projects for the next season. We are working together with several familiar expert faces, and I'm thrilled to say that we also added a couple new ones. Their identities are still a secret ... sorry! New people bring new ideas, so I must say I'm excited for us all. In mid-March we will all be together in a studio in Cleveland, Ohio, to film 13 new episodes for season 10. Then the production team needs a couple months to get it all together. 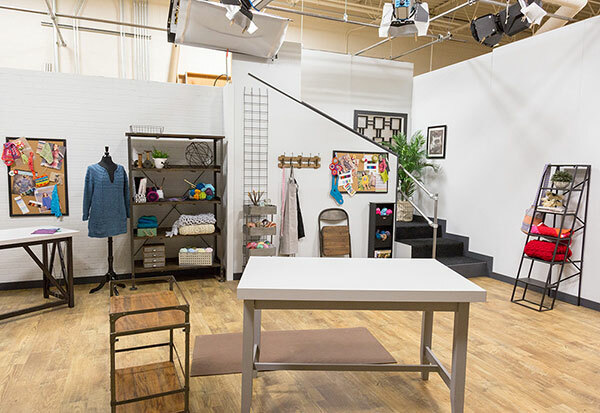 In late June this year the first lucky viewers will be able to catch the new season 10 rollout on PBS, and so will our All-Access Club members, as well as members of Annie's Creative Studio. Connie (left), Michele (right) and I pause for a photo op during a review of projects. The Cleveland studio is quiet and lonely, just waiting for us all to arrive! • Season nine is airing on PBS; be sure to check your local listings to find out when you can watch and set that DVR! • All nine seasons of Knit and Crochet Now! are available to stream from Annie's Creative Studio. You can try this premium creative-education network for 30 days for free! There is instruction on all things crafty, not just knit and crochet, so prepare to expand your horizons! • Season nine of Knit and Crochet Now! is presently airing on Create TV. This is a great way to catch our show! • The new season is available for viewing on the Knit and Crochet Now! website. All of the patterns that are featured in each episode are available as free downloads from Knit and Crochet Now!, so hop on over there to grab your free copy so you are ready to stitch along!